Two concerning and contradictory findings about local news attitudes emerged from a Pew Research Center study released Tuesday. While half of Americans say local media don’t cover their communities, almost three-quarters don’t realize that the loss of local news has been driven by the demolition of the business model that has historically supported newspapers. The Pew study, which surveyed 35,000 Americans between October and November 2018, found that more than 70 percent of Americans think their local news outlets are doing very well or somewhat well financially. As a result, less than 15 percent have paid for subscriptions or donated to local news outlets in the past year. Nearly half of those surveyed by Pew say the local news they receive isn’t about the community in which they live. 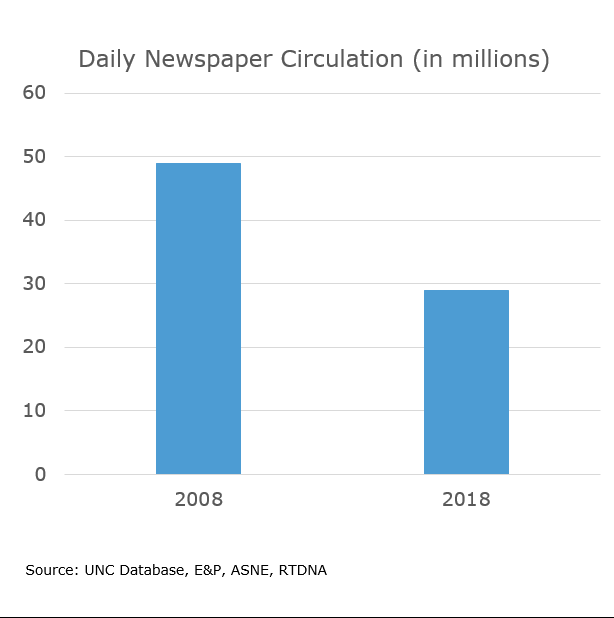 More than 1,800 local newspapers in the U.S. – or one in five – have closed or merged since 2004, according to a report by the UNC Center for Innovation and Sustainability in Local Media, The Expanding News Desert. Many of the country’s remaining local and regional papers have pulled back circulation and coverage from outlying areas as both daily circulation and newsroom employment dropped by nearly 50 percent since 2008, leaving Americans in thousands of communities without a credible and comprehensive source of local news. Similarly, Phil Napoli at Duke University found that were no articles on local issues and events in 20 percent of 100 communities sampled during a seven-day period in 2016. Local TV stations top the list of outlets where Americans often get local news, according to the Pew survey. Some 38 percent of U.S. adults say they often get news from TV, while 20 percent primarily turn to local radio and 17 often use local daily newspapers. But nearly a third – 28 percent of those surveyed – said they turn to less traditional types of providers for local news, such as online forums and community newsletters. While nearly 80 percent of Americans who get local news from television and radio access it through the television set or the airwaves, nearly half – 43 percent – of the daily newspaper readers access that news digitally rather than in print. For much more on ghost newspapers and the loss of newspapers and readers in the Expanding News Desert, visit our report page.